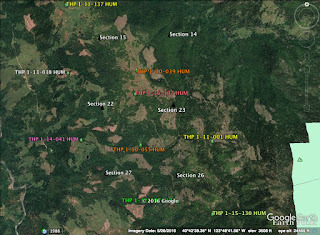 THPBlog: Green Diamond Resource Company to clearcut log trees up to 72” dbh SE of Eureka, CA. This THP is about 20 miles SE of Eureka, CA and about 4 miles SE of the town of Maple Creek at an elevation of 2,100 to 3,800 feet. Green Diamond Resource Company is planning a mostly clearcut tractor and cable logging operation on steep and unstable slopes in Douglas fir forests. The THP area flows into the Mad River which is listed as an impaired watershed for sediment, temperature and turbidity. There are 7 landslide terrain sites including 2 shallow rapid landslides in unit A, 4 shallow rapid landslides in unit C, 4 shallow rapid landslides in unit F, and a deep seated landslide near the SW corner of unit C. Eight road drainage sites are planned for work Including rocking, dip construction, ditch cleaning and culvert repair/replacement. Green Diamond Resource Company is planning to use a short segment of steep temporary road inside unit D that is on 35% slopes within 75 to 100 feet of a class II (mid sized) watercourse. In 2014, a sharp shinned hawk was spotted .5 mile west of unit C, and in 2000, a sharp shinned hawk was spotted 1 mile east of unit B. In 2011, a Cooper's hawk was spotted .5 miles south of unit E, and in 1996, a Cooper's hawk was spotted 1.2 miles east of unit E. Golden eagles have been spotted within .5 miles of the THP area. There are over a dozen spotted owl nesting territories within 1.3 miles of the THP area including nesting territories within .25 miles of unit F, and within .5 miles of units C and D.